The short answer is: Because Gourmet Magazine says so. 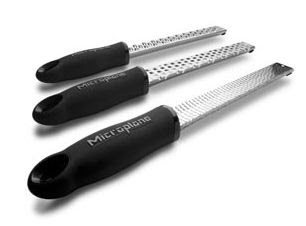 Long Answer: At the very least, you should know what a microplane is. Avoid embarrassing yourself at a dinner party and get familiar. But let's put aside the issue of protecting your fragile reputation. A microplane is a very handy kitchen tool. 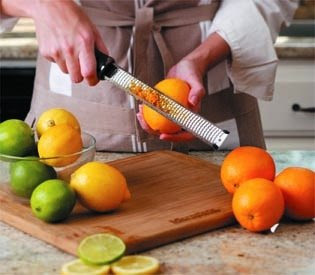 It grates or peels your fruits, vegetables, cheeses, roots, etc... all with ease! It's easy to clean and store. I swear by it when a recipe calls for the zest of a lemon, or grated fresh ginger, or even shaved chocolate. You can get one for under $15. But what's really interesting to me is that Gourmet Magazine would have you think the microplane has gone mainstream. I was reading the old Thanksgiving 2007 issue the other day, and I found a recipe with an ingredients list that called for something to be grated on a microplane. Gourmet just assumes you know what it is as they go about their business of sharing the recipe. They don't pause for a second to help you poor unfortunate (naive, ignorant, uneducated) souls who aren't familiar with the term. Or maybe they figure it's fine to say microplane in the ingredients list because you'll look it up in the dictionary. And speaking of the dictionary, it's not officially added, though it does have an entry in Wikipedia and it's been reviewed all over the internet including on non-food sites, to rave reviews. It's basically the Kleenex of graters, the only one with a household name. I mean, who asks for a face tissue when you could ask for Kleenex instead? How to grate Parmigiano-Reggiano may seem trivial—at least it did to us, until the Microplane rasp (available at cookware shops) came along. Suddenly, we were getting far more volume from its razor-sharp blades than we were from the small round holes of a hand or box grater, making our cup and weight measures inconsistent. So we wondered just how different the volume produced by the various tools of the trade might be. Our kitchen drawers revealed a hand grater, a rotary grater, a box grater, and the rasp. We set them next to a food processor, then subjected an ounce of cheese to each. The results ranged from a scant 1/3 cup of finely ground nuggets (food processor) to 1 1/4 cups of tissue-thin wisps (rasp). The fine shreds created by the hand grater, the rotary grater, and the small round holes on the box grater (our standard method) varied in volume the least, coming in at about 1/2 cup. Powdery pregrated cheese (not shown), snubbed by the cognoscenti, came in at about 1/3 cup. Who knew there would be such discrepancies? This is why our recipes specify weight first, then volume. And it's mentioned every month in the tips section. anonymous - that's really interesting, because i, as an inconsistent gourmet mag reader, only just noticed the mention of microplane WITHIN a gourmet mag recipe for the first time. i'm not surprised they've been talking about it for years since i'm sure gourmet mag is on top of what are the best kitchen tools. but i was going to clip that recipe i read in the thanksgiving 2007 issue and share it with a friend, and i'm not so sure my friend would have known what a microplane is. IMO, recipes should stand alone and not be too insider baseball. But like i said in the post, maybe the microplane isn't so insider baseball afterall. thanks for sharing that info!